Christmas is a great time of year for posh flavours of crisps, and Aldi haven’t disappointed us with their new range. 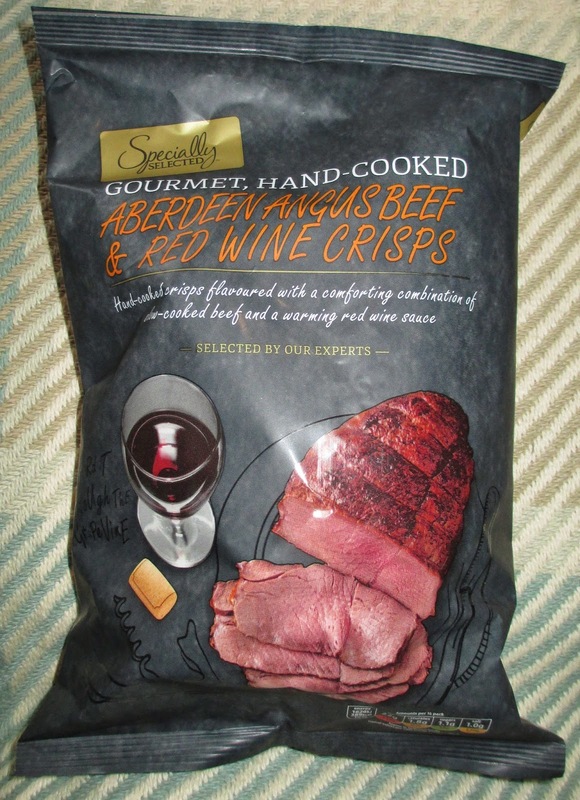 As a fan of meaty crisps I was quick to pick up these new Aberdeen Angus Beef and Red Wine ones. The packaging is very posh and the black packet makes these look rather upmarket. We decided to share them one lunch time, as they are in a nice big bag. I liked the texture of the crisps, they were crunchy but not sharp and hard. A lot of “posh” crisps seem to be very hard and still quite thick actually making them a bit uncomfortable to eat. They were crunchy, but the thickness wasn’t too much meaning they were nice to eat and munch on. The flavour was lovely too, they were very meaty, and the lovely tones of beef came through perfectly. There was just a hint of red wine sauce, giving a nice slight contrasting flavour. There were some herbs too adding to the depth. These are really nice crisps for munching, and would work well shared in a bowl with friends. A good meaty flavour, with just a hint of posh for the christmas season.